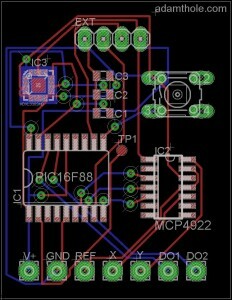 The link above gives you the schematics and PCB board layout for the Tilt Board v3. They were created using the program Eagle CAD 5.4.0 which is available to download from here. Eagle CAD is an excellent (and low priced) program that has a free version available. The zip file contained in the link above this post contains two files. The .sch is the schematic and the .brd is the board layout. For an excellent tutorial on how to use Eagle CAD software check out this tutorial by Spark Fun. If you don’t want to mess with learning Eagle CAD but you still want your own board you can order as many as you want from Batch PCB. They are who I ordered my prototypes from and are a really cool company. Please feel free to use these files for any personal use. I am making them available to help others learn more about electronics. They may not be used for commercial purposes. Pingback: Adam Thole’s Tilt Board v3 - Schematics and Board Layout | Xbox 360, PC, PS3, Nintendo Wii - Reviews, Chat and Video.